Do you know that curators are responsible for the following? Writing labels, text panels, articles, books, etc. Curators are experts in a specific field and they are tasked with finding creative ways to share and safeguard the collection. Curating offers the opportunity to explore a museum’s collection through a variety of different lenses, such as cultural, political, social, etc. Through the Mellon Undergraduate Curatorial Fellowship Program, we aim to help develop the next generation of curators. The Program is divided into two components: the Summer Academy and 2-year Fellowships. The Summer Academy is a one-week immersion program designed to provide a rich experience in the museum environment and expose the participants to career options related to art and art history. Each Summer Academy includes workshops, tours, group and individual projects, and discussions. Individuals who have a strong interest in Art History, History, Anthropology, Archaeology, Museum Studies, other cultural studies are preferred. Application Deadline: Friday, February 22, 2019. Return to the Careers page to begin your online application. All Summer Academy participants are eligible to apply for the 2-year Fellowship combining curatorial mentoring with hands-on curatorial experience within the museum. Each Fellow is partnered with a curator who crafts a unique, hands-on curatorial experience focused on developing research, writing and public speaking skills. Fellows also participate in museum events, conferences and annual National Convenings with Fellows from partnering museums. 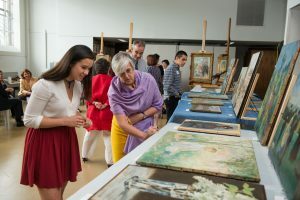 Each year, Fellows must commit to approximately 10 hours of monthly engagement during the academic year followed by a 10-week, full-time hands-on museum experience in the summer. Fellows receive an annual stipend of $10,000. Eligibility Requirement: All participants of the most recent Summer Academy are eligible to apply. Strong interest in curating in an art museum. Strong interest in attending graduate school. For more information about the program, please contact Michele Valentine. If you are a faculty member and would like to discuss the program further, recruitment strategies for your campus, or other museum partnership opportunities, please contact Michele. Established in 2013, the Andrew W. Mellon Undergraduate Curatorial Fellowship Program provides specialized training in the curatorial field for students across the United States from diverse backgrounds within the following institutions: The Nelson-Atkins Museum of Art, The Art Institute of Chicago, The High Museum of Art, Atlanta, The Los Angeles County Museum of Art, The Museum of Fine Arts Houston and the Philadelphia Museum of Art. The fellowship seeks to make a critical impact on American art museums by developing gifted curators who are committed to engaging with the full spectrum of museum audiences. This initiative is generously supported by The Andrew W. Mellon Foundation. More information about the need for a diverse education pipeline into the curatorial field is available in the Andrew W. Mellon Foundation Art Museum Staff Demographic Survey published in 2015. The Andrew W. Mellon Foundation currently makes grants in five core program areas: Higher Education and Scholarship in the Humanities; Scholarly Communications; Arts and Cultural Heritage, International Higher Education and Strategic Projects; and Diversity. Within each of its core programs, the Foundation concentrates most of its grantmaking in a few areas. Institutions and programs receiving support are often leaders in fields of Foundation activity, but they may also be promising newcomers, or in a position to demonstrate new ways of overcoming obstacles to achieve program goals. Our grantmaking philosophy is to build, strengthen and sustain institutions and their core capacities, rather than be a source for narrowly defined projects. As such, we develop thoughtful, long-term collaborations with grant recipients and invest sufficient funds for an extended period to accomplish the purpose at hand and achieve meaningful results.